ST. GEORGE — Four Southern California men were arrested and face multiple felony charges after an alert pharmacist in St. George called police Tuesday to report suspected prescription fraud. Alejandro Davalos, 20, of Bell Garden, California, has been charged with six third-degree felonies, including five counts of possessing a forgery device and one count of possessing multiple identification documents, as well as five counts of possession of an altered/forged prescription, possession of marijuana and possession of paraphernalia, which are class B misdemeanors, according to the affidavit filed Wednesday in the 5th District Court. Enrique Tello-Pena, 22, Cristian Puente-Gurrola, 23, and Hector Luis Fernandez, 22, of Los Angeles, are facing six third-degree felony charges that include five counts of possessing a forgery device and one count of possession of another’s identification documents, as well as one count of possession of marijuana and one count for possession of paraphernalia, both class B misdemeanors. The charges stem from an incident that began Tuesday afternoon when a pharmacist at Brent’s Pharmacy, at 2378 E. Red Cliffs Drive, called the St. George Communications Center reporting possible prescription fraud after a man using the name “Cristian Gurolla” attempted to fill a prescription. The pharmacist told police he had received an email alert sent by an investigator with the Division of Occupational and Professional Licensing detailing an incident where an “Enrique Tello” attempted to pass a fraudulent prescription written by Dr. Kilfeh out of East Los Angeles. The pharmacist became suspicious when he noted that Cristian Gurrola’s prescription listed the same doctor’s name out of East Los Angeles Doctors Hospital. Officers spoke with Gurrola who claimed he had gotten the prescription from “an associate waiting for him outside in the car,” the statement says. Police located the car where Fernandez, Pena and Davalos were waiting, and after detecting “an odor of marijuana in the vehicle,” all four men were detained before officers began a search of the vehicle. The statement says that officers recovered a total of 32 fraudulent prescriptions, including six in Gurrola’s name, five for Davalos and 21 prescriptions were written for Pena. They also found empty bottles of codeine that had been prescribed to Pena, along with blank prescription pad sheets and a printer, as well as a substance that appeared to be marijuana, a glass bong and a grinder. Detectives inspected the prescription from Brent’s Pharmacy that was turned over to police and noted it appeared to have come from East Los Angeles Doctors Hospital. It contained the names of eight doctors with accompanying license and DEA numbers, including a physician by the name of Dr. Kalfeh. Armed with the alert sent out by the Department of Occupational and Professional Licensing, detectives interviewed Gurrola who admitted he did not have a valid prescription from a doctor, but claimed that Pena had given him the prescription while they were in the car, police say in the statement. Pena told police that all four men were filling promethazine with codeine prescriptions at pharmacies throughout northern Utah and claimed the phone number listed on the prescription’s actually went to Fernandez, who, purporting to be the doctor’s office, would confirm the prescription when the pharmacies called. While Fernandez confirmed to police that the number listed on the prescription pad was in fact his phone number, he claimed he had been getting “strange calls from pharmacies, which he had ignored,” and denied Pena’s claims. Officers spoke to Davalos, who denied any knowledge of the prescriptions, despite the fact that a number of them discovered by police were issued in his name. He owns the vehicle the group was traveling in. Using a number gleaned from an internet search, officers called the East Los Angeles Doctors Hospital and spoke with Dr. Kilfeh, who denied writing the prescriptions for codeine and told police he had received a number of calls from various pharmacies referencing fraudulent prescription activity. 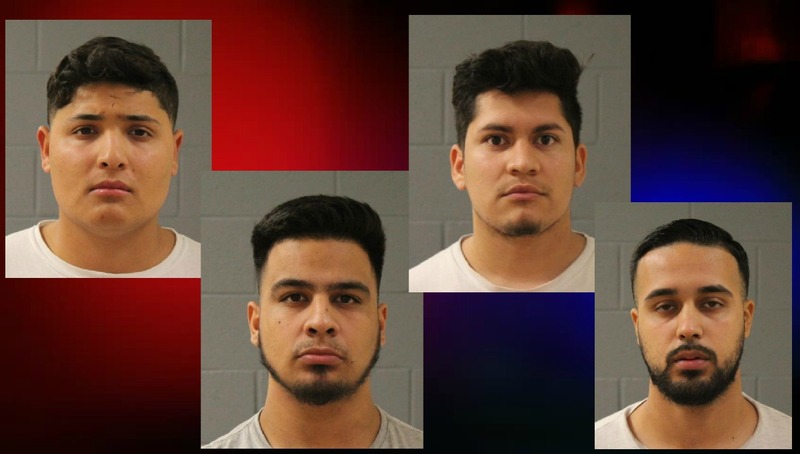 All four men were arrested after Gurrola and Pena admitted to passing forged prescriptions in Utah, and after officers determined that Davalos and Fernandez were “participating and facilitating the fraud,” and that all four men were traveling together in a vehicle where numerous fraudulent prescriptions, marijuana and paraphernalia were found. The men were then transported to Purgatory Correctional Facility. All four defendants are scheduled to appear at 5th District Court Jan. 19 at 1:30 p.m. Gurrola is being held on $5,000 bail, while bail for Pena, Fernandez and Davalos has been set at $7,500 each. Why don’t they just inject some of that nice chinese fentanyl. It’s a lot easier to get. I read in one article that some of the mexican cartels decided to stop pushing the chinese fentanyl because it was killing too many customers. Comment, this is not a personal use situation. This is an East LA gangbanger franchise venture that underestimated the integrity of the S. Utah pharmaceutical supply chain. While ONE pharmacist called, it looks like they were on a tear, fooling many, being ignored by many. It was good to see the cops make a righteous bust, though. The email was actually read by Brent and he acted on it. Makes one wonder how much script fraud goes under the wire. Well they’re behind bars where they belong …..
Oh this is new, gang bangers coming out to Utah to Double Cup some Drank. All the cops needed was ONE PHONE CALL and they roped those dopes! Sounds like they went through a few bottles, and had made many attempts that failed. Most pharmacists just don’t care now? January 19th for their court date? January 19th is a Saturday. The Court is not open during the weekend. We don need no stinkin’ wall. We gots in already. Being from Southern California, I can tell you there, this would just be a normal, daily “incident”. Probably wouldn’t even be reported unless it was a slow news day.